The project focuses on the task of creating concepts for experiencing and interacting with data in the smart city environment of today and the future. 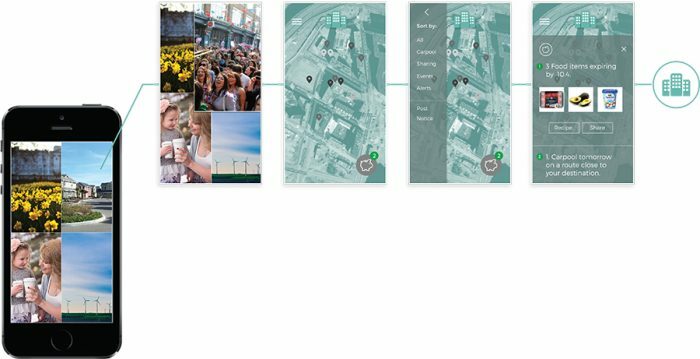 As our goal we aimed to design an intuitive experience out of smart data, giving people an understanding of their reality and influence over their environment. We chose urban mothers as our main user group, and developed personas and three experience goals for them based on several user interviews. The goals were Peace of mind, Meaningful engagement and belonging, and Self-fulfillment. Based on the experience goals, we created a concept called Moodifier. The Moodifier is a way to representing data from different aspects of life through images in a mobile application. The various systems or environments are presented simultaneously as a collage of images where the images can scale in relation to each other to represent the relative importance of incoming notifications. The Moodifer is perceivable, actionale, and changeable. Through a visualised subtle representation of notifications, users become aware of changes and can decide what to do and when, which give them a better sense of control and promotes peace of mind. Meaningful engagement and belonging is enhanced through seeing the effect of actions and connecting to the community, which also brings satisfaction and self-fulfilment. Our radical concept, Activitree, is an extension of the applicable concept towards making data publicly visible in communities. The overall status of the community is shown visually through creative community-specific means, such as lighting displays or wall screens. As community members can access their own data and take action to affect the system status through their own mobile devices, the Activitree provides a means to promote engagement in the community and show people the effect of their actions on their immediate environment.